We will be airing today with our host “Brother James Foxx” on his show “The Defender”. 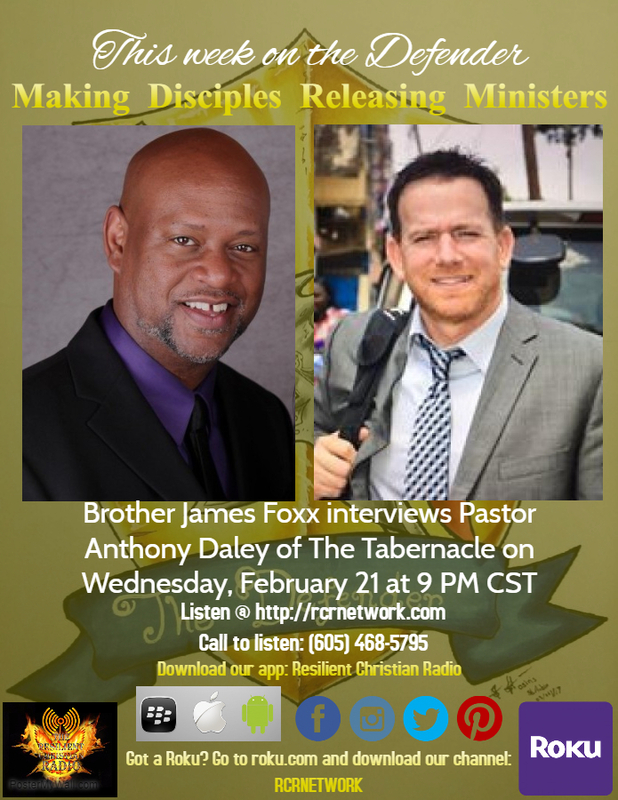 This week, Brother James interviews Pastor Anthony Daley talking about Making Disciples Releasing Ministers. Since 2003, Pastor Anthony and Julia Daley have been serving as the Senior Pastors of The Tabernacle, now a multi-campus ministry located in Clarksville, Tennessee. The Tabernacle planted a second campus in Clarksville, TN in 2010. This campus became known as the Clarksville Campus. The original location still houses a thriving community of believers. That location is The Tabernacle Indian Mound Campus. Please join us every Wednesday for The Defender @ 9 PM CST, 10 PM EST, and 7 PM PST. *For more about brother James visit him on The Defender's page.